I live in the country in a small neighborhood served by a well. Our water has iron in it and also the water smells bad. See the attached water report. Can I install a chlorinator and filter for my home only? My neighbors are not interested in fixing the main well water. How can I install a chlorinator for just my home? Thanks for emailing. Yes, it is possible to install a chlorinator for just your own home using a proportional chlorinator and Pro-OX iron filter. Use a proportional feed type chlorinator, that injects a precise amount of chlorine based on the flow of water. 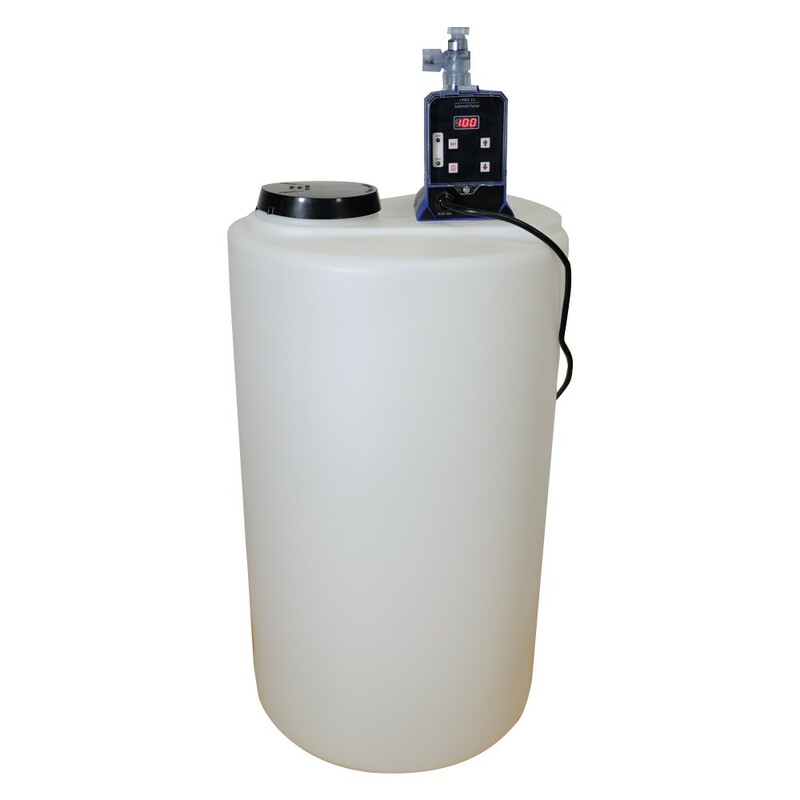 Use a retention tank to allow some contact time for the chlorine to work and dissipate. 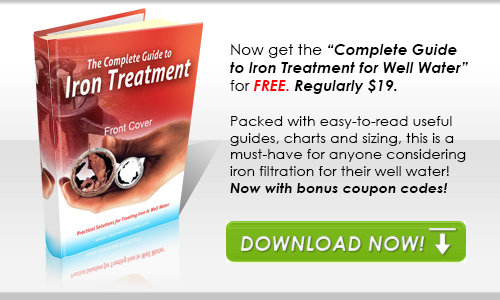 Install a Pro-OX iron filter to remove iron, manganese and reduce chlorine. 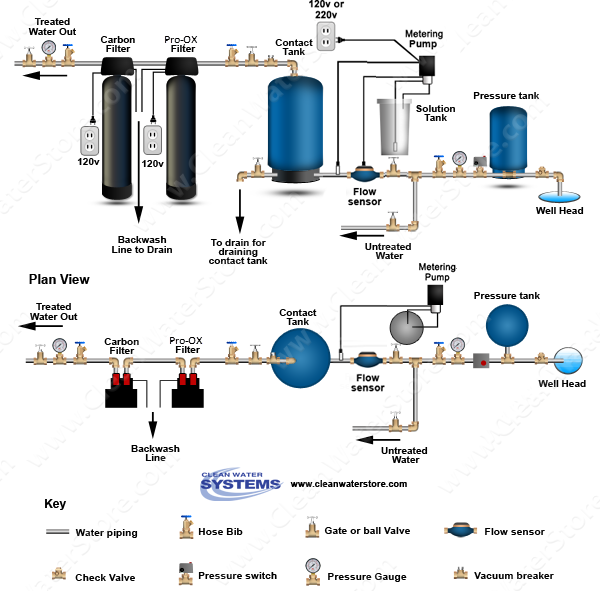 Install a carbon backwash filter to remove residual chlorine as an option. How this application will work is the chlorine (mixed with water) is injected whenever the water flows through the Flow Meter which will then energize the Metering Pump to begin injecting solution based upon the rate of flow. Once injected the 40-gallon Contact Tank allows for sufficient retention time so the chlorine can react with the contaminants and fully oxidize for filtration. The Proportional Flow Chlorinator will allow us to only inject the chlorine solution based upon water flow. Installation is quite simple as well, simply plug the Metering Pump into a standard outlet and connect the two dry contact wires at the Metering Pump to the two dry contacts on the Flow Meter. Pro-OX Manganese Dioxide media is an NSF Certified natural high purity mineral that is used for removing Iron, Hydrogen Sulfide, and Manganese from water supplies. The media utilizes an oxidation-reduction reaction and filtration process similar to Greensand but at a much higher level of performance. Pro-OX has a much higher surface area, is much more porous than Greensand, and also lasts much longer (usually 10+ years depending on usage) compared to around 5 years maximum for other filter media. The high purity coconut shell activated carbon will remove any residual chlorine, tastes, and odors. These filters are fully automatic and use the reliable 5900 control valve for dependable filtration with minimal maintenance requirements along with being quite user-friendly in operation. The following will show images and product links for additional information on the recommended components. If you have any questions, please let me know. The CT-40 tank is a durable easy-to-install retention tank designed to provide optimum contact time during chemical treatment. These lightweight seamless totally non-corrosive retention tanks are ideal for new and replacement installation where durability is at a premium. 100% non-metallic polymer materials. Impervious to chemical attack. Comes with 1-1/4 inch inlet. Dimensions: Two sizes to choose from, same price. Either 16” D x 58” Tall or 21” D x 36” Tall. Pro-OX 5900-BT Iron Filters are the longest lasting and most powerful system for removing iron, rust and sediment from well water. Contains a unique blend of high-purity manganese dioxide (Pro-OX) and naturally mined Zeolite for filtration down to 3 microns for maximum filtration and iron removal. Pro-OX Filters include: pipe connectors; by-pass valve; filter gravel, Pro-OX Manganese Dioxide NSF Certified filter media; Zeolite Turbidity Filter media, filter gravel, filter tank; heavy-duty automatic backwash control valve. Reliable heavy-duty 5900-BT control valve is easier to program than other valves and features a built-in flow sensor that tracks water usage and monitors flow. Free Shipping: All quoted prices include shipping within the continental U.S.
No Sales Tax as well unless shipping to California.